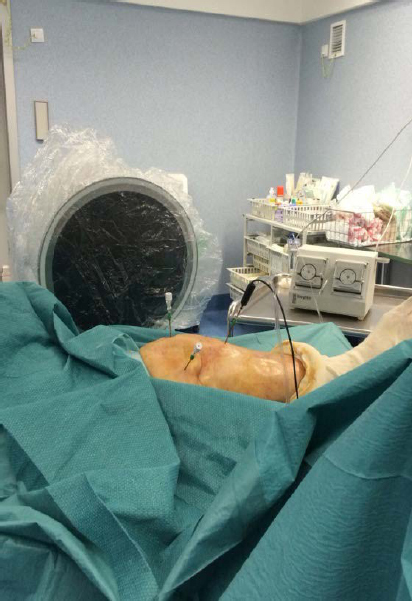 Background and objectives: Cooled radiofrequency (RF) for neurotomy of genicular nerves has been proved to be efficient in short-term (12 weeks) to relieve the knee pain in severe osteoarthritis (OA) and total knee arthroplasty (TKA). This study is aimed to analyze the results of cooled radiofrequency in patients with chronic knee pain after one year of follow-up. Design: A retrospective case-series study. Methods: Forty patients underwent cooled RF of genicular nerves. We evaluated results of 36-Item Short Form Survey (SF-36), Knee Society Score (KSS) and Visual Analogue Scale (VAS) preoperatively and after one-year follow-up. Results: Regarding SF-36, a significant improvement in pain, general health and overall outcome was obtained. Preoperative average VAS score was 8.5; 1 year after surgery this score was 5.3. Significant differences were found at the knee score (KS) in KSS but not in the function score (FS) in KSS. Conclusion: Cooled RF for neurotomy of genicular nerves is still effective after 1 year of the procedure in the treatment of chronic knee pain due to osteoarthritis. The rate of conversion to arthroplasty is low. This technique could be a good alternative for chronic pain management in patients in whom TKA is not the first option of treatment. Osteoarthritis (OA) is a progressive disease that becomes symptomatic and with a high prevalence in the population aged over 50 years. It mostly affects the knee joint. With the increase in life expectancy, OA is likely to have become the fourth leading cause of disability by 2020. The treatment for OA has been staggered, starting from the easiest measures and lacking of collateral effects and being followed by more complex treatments which show more possibilities in front of these collateral effects. The non-pharmacological treatment consists of physiotherapy, physical exercise, hydrotherapy and weight loss. Acetaminophen and nonsteroidal anti-inflammatory drug (NSAID) are not exempt of collateral effects (digestive bleeding, hypertension and kidney problems), therefore, should be managed carefully. In patients with contraindicated NSAIDS, opioids can be considered (tramadol, oxycodone, tapentadol or topic buprenorphine). The American Academy of Orthopedic Surgeons, in the clinical practice guide of 2013, did not recommend the utilization of hyaluronic acid infiltrations in knee OA. They specified its use to cases in which the anterior measures had failed. When the conservative treatments fail, surgery must be considered. It is important to take into account that we are using an invasive treatment in advanced age patients, most with comorbidities. Furthermore, the residual pain after a total knee arthroplasty (TKA), especially in the inner face, is relatively frequent. Some series report an incidence of 20%. There are authors who think that this unexplainable pain is related to the nerve terminals disruptions of the C fibers during surgery. Usually, this pain decreases during the following 5 years. A conservative treatment is recommended if the cause is unknown. The knee joint capsule is innervated by the genicular nerves. After the works of Kennedy et al. and Dellon, the innervation of the joint capsule has been standardized in two groups of nerves. The anterior group is formed by branches from the femoral nerve: branch of the vastus lateralis, the vastus medialis, the vastus intermedius and the saphenous nerve. It is also formed by branches of the common peroneal nerve (recurrent branch and lateral retinacular branch). The posterior group is formed by branches from the obturator nerve and tibial nerve. Studies from Choi et al. confirmed by Franco et al. concluded that, of these nerves, the branches from the femoral nerve are tributaries of radiofrequency ablation. In addition, these nerves show a constant pathway over the periosteum in the junction of the epiphysis and diaphysis at the distal level, which can be localized by fluoroscopy. The lateral inferior genicular nerve is dismissed because of its proximity to the sciatic nerve. Franco et al.’s work also demonstrated the usefulness of a fourth nerve, the intermediate genicular nerve, which is important for the demarcation of much of the prerotulian anterior zone of the capsule, which can be located on the periosteum, in the middle of the femur’s anterior face, two centimeters proximal to the junction [Figure 1] and [Figure 2]. 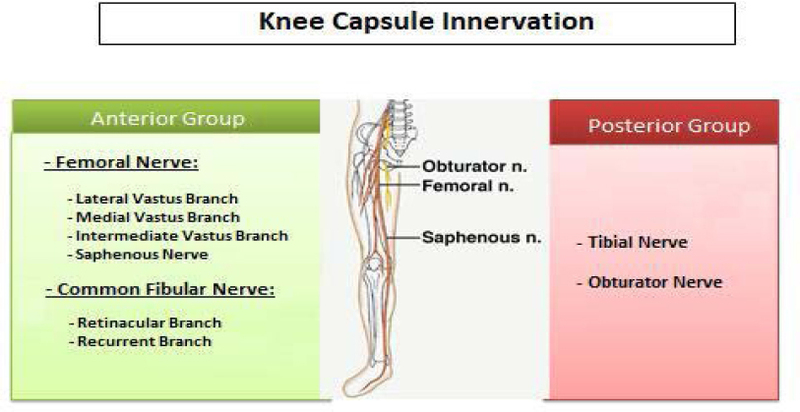 Figure 1: Innervation of the knee capsule. Figure 2: Superomedial genicular nerve. Cooled radiofrequency (RF) consists of creating an injury in the nerve trough a high frequency flow. Unlike conventional radiofrequency ablation (RFA), in cooled RFA through a closed circuit where intravenous flows, we can create an injury for a longer period of time, at a lower temperature (standard RFA 90°C, cooled RFA 60°C) and within an area 8 times larger [Figure 3]. As the lesion is spherical and larger (about 1,012 mm in diameter), the chances of neurolysis of the nerve increase. 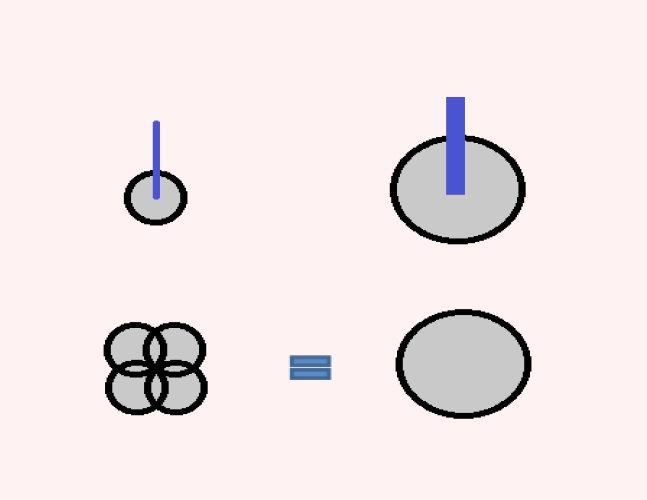 Figure 3: Comparison of the size of the injury with cooled radiofrequency (RF) and conventional RF. Studies have shown that neurotomy through RF of the genicular nerves can be an efficient short-term measure (12 weeks) to reduce the pain for knee OA, and in determined patients with painful TKA.,, Bellini and Barbieri published the first retrospective study in a group of 9 patients with knee OA, using cooled RF with a monitoring of 12 months, concluding that most patient experiment significant relief and improvement of the function. In this study, we performed a retrospective case-series reviewed of 40 patients who underwent cooled RF of genicular nerves, to analyze the effect of cooled radiofrequency in patients with chronic knee pain after one year of follow-up. This study was performed at the Hospital Universitario de Son Espases, Mallorca, Spain. All patients signed an informed consent for the procedure. Between January 2015 and May 2016, the cooled RF neurotomy procedure of superior lateral genicular nerve (SLGN), superior medial genicular nerve (SMGN) and inferior medial genicular nerve (IMGN) was performed in a series of 40 consecutive patients. 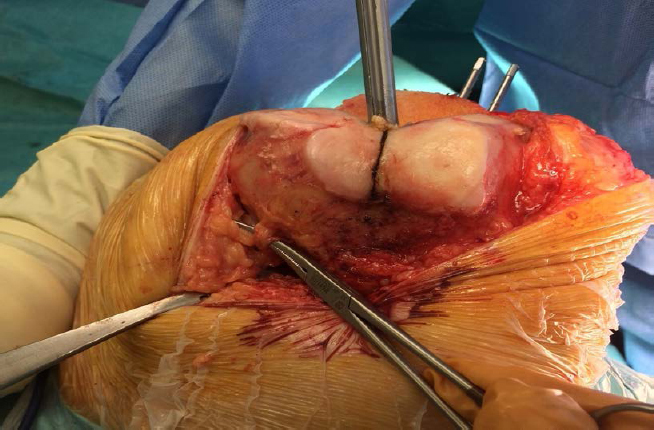 Surgical procedure was performed in 33 patients with OA (two of them with inflammatory causes) and in 7 patients with TKA (four with revised TKA). There were 9 patients with knee instability, 7 with hip joint arthroplasty and 14 patients with mild radiculopathy, or who underwent surgery with vertebral instrumentation to see their influence. Each patient was monitored routinely (intravenous, TA, pulse, O2 saturation). The anesthesiologist performed the sedation with remifentanil perfusion 0.06 μg/kg/min and propofol 2 mg/kg/h. The knee was placed on a soft support elevated in slight flexion (20o), so that the contralateral knee did not obstruct the radiological profile view. The technique was performed under fluoroscopic control. The image intensifier and screen were placed on the opposite side. No previous anesthetic block test was performed [Figure 4]. Figure 4: The optimal position for fluoroscopic examination must be pursued. Note: (A) The position of the needles. But with the rotated knee, we cannot know if the needles are in the target point. (B) The image of a strict profile. The interventions were performed on an outpatient basis, under usual aseptic conditions and by the same surgeon [Figure 5]. In the first place a fluoroscopic control was carried out in the anteroposterior projection. At each point where the lesion is to be infiltrated, 2 mL of 2% Lidocaine was infiltrated without epinephrine. The needle was placed on the metaphysodiaphyseal junction of the target zones. The needles were then changed through the puncture needles of gauge 17 and 75 mm in length, where the electrode with an active tip of 4 mm (Coolief, Halyard Health, Alpharetta, GA, USA) will be introduced. Then a control was performed on the profile projection, looking for the references described by Franco et al. for the placement of the tip of the needle (60% of the anteroposterior distance in the femur and 70% in the tibia). Figure 5: Placement in the operating room. The needle slided in contact with the periosteum. The tip of the electrode was placed parallel to the nerve over the target area. The exact position of the fluoroscope was essential in both projections. No sensory-motor stimulation was performed. The cooled RF system was used for 2.5 minutes at 60°C at each of the three target points described (SLGN, SMGN, and IMGN). No lesion was generated in the intermediate genicular nerve. The primary outcome, treatment success, was defined as 50% or greater reduction in VAS score at one year after the procedure. 36-Item Short Form Survey (SF-36) and Knee Society Score (KSS) were used as secondary outcome measures. Measurements of the mechanical axis of the operated limb were taken. Charlson’s comorbidity index (absence of comorbidity 0–1 point, low comorbidity 2 points and high > 3 points) and its relation to 10-year life expectancy were calculated. 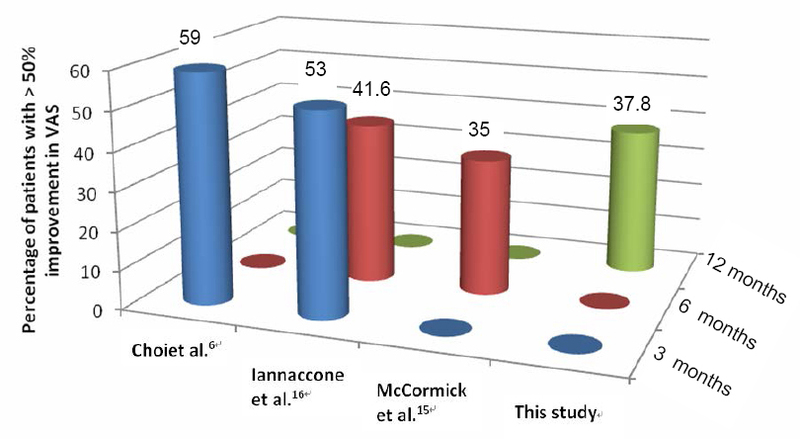 The VAS for pain (percentage of patients with 50% or more improvement), KSS and SF-36 were used to measure the results after one year of the procedure. The KSS consists of two parts. KS measures pain, range of motion, stability and alignment. FS measures the distance able to walk, the difficulty in going up or down stairs and the need for walking aids. The result is rated as excellent (80–100), good (70–79), regular (60–69) and bad (< 60). The SF36 values eight parameters: physical function, social function, physical role, emotional role, mental health, vitality, pain and general health. Zero is the worst conceivable health and 100 the best. Data are presented as mean (SD), median (IQ) or number (%). Intergroup comparisons at baseline were analyzed using independent-samples t-test or Mann-Whytney U test for continuous variables and chi-square or Fisher’s exact test for categorical variables. Intragroup differences between baseline and one year were evaluated using paired samples t test or Wilcoxon’s signed-rank paired test for continuous variables and McNemar test for dichotomized variables. Intergroup comparisons at one year were assessed using analysis of covariance and Fischer’s exact test. A two-tailed P-value < 0.05 was considered statistically significant. Statistical analyses were performed using SPSS 23.0 (IBM, Armonk, NY, USA). Accepting a 95% interval confidence and 80% power, 35 patients are required to detect an average difference between preoperative and postoperative 4 points according to VAS. Adding 10% to cover possible experimental losses, the sample increases to 40. Between January 2015 and May 2016, the data were recorded for 40 patients (33 with OA and 7 with TKA) who underwent cooled RF of the genicular nerves. There were 31 procedures in women and 9 in men. Three patients did not respond to the postoperative survey one year later [Table 1]. In this group, 35% of patients had radiculopathy or had been operated on in the spine with presence of irradiation on the limb, 17% had total hip arthroplasty on the same side or with coxarthrosis, and 22.5% had symptoms of instability in his knee. None of these associations influenced the results. No patient had complications such as hemorrhage, infection, motor disturbances or sensitivity in the area corresponding to the genicular nerves. A patient with severe OA with previous subtotal external meniscectomy, a history of cervical disc herniation and essential tremor, reported feeling of instability after radiofrequency and suffered two falls in 6 months. A patient with a history of controlled Parkinson’s disease also suffered more falls after cooled RF. Two patients in this group were operated for fracture of the proximal end of the femur during the 12 months of follow-up (5%), although it is difficult to say if their falls were caused by an alteration of proprioception after radiofrequency or is the expected natural course of hip fractures in the elderly at risk. Two TKA (5%) were placed in two patients in whom there was no improvement in pain, one of them with severe OA post-osteotomy with instability. 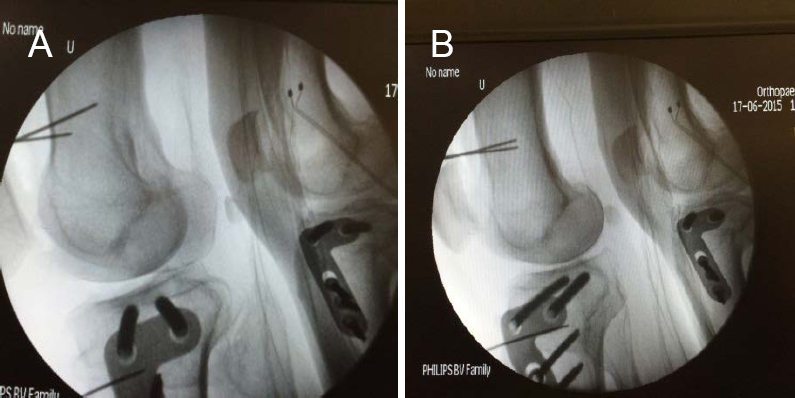 After TKA, which was performed 18 months after radiofrequency, both patients had complete pain relief. Although after one year of performing the procedure the percentage of patients who had improved more than 50% in VAS was higher in the OA group, this difference was not significant. Furthermore, 38% of patients described 50% or more pain relief after 12 months of follow-up. A 5% of patients are maintained with a VAS of zero after 12 months of follow-up [Figure 6]. 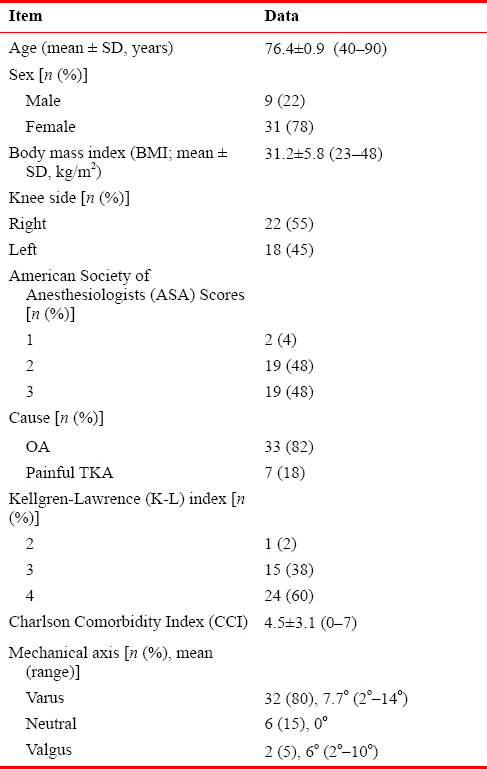 Figure 6: Percentage of patients with an improvement of 50% or more in Visual Analogue Scale (VAS) after one year in osteoarthritis (OA) and total knee arthroplasty (TKA). Note: OA vs. TKA, P = 0.835, Fischer's exact test. One year after radiofrequency, resting pain had disappeared in 58.5% (OA group) compared to 31.7% (TKA group) of patients who continued to present it. One year after surgery, 65.9% of patients would repeat the procedure, compared to 24.4% of dissatisfied patients. [Table 2] reflects the final VAS′s results, range of mobility and the values from the KSS, showing an improvement in all parameters, although only a significant improvement is shown in KS and VAS. 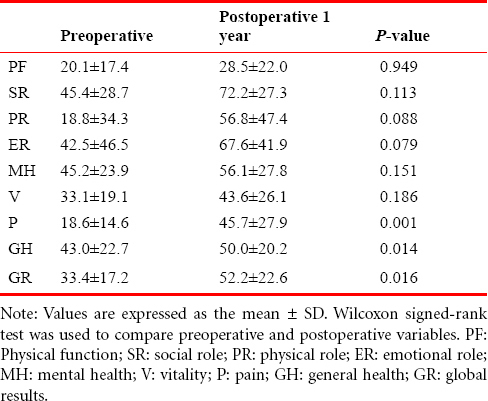 Preoperative and postoperative values in SF36 are reflected in [Table 3]. A significant improvement is obtained regarding pain, general health and overall rating after one year from the procedure. 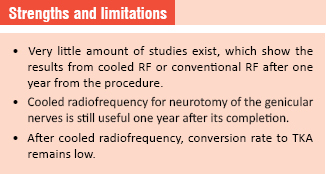 Few studies exist, which show the results from cooled RF or conventional RF after a year from the procedure [Table 4]. The average percentage of patients which obtained an improvement of more than 50% in the VAS was 55.5% at 3 months, 38.3% at 6 months and 37.8% at 12 months [Figure 7]. Figure 7: Percentage of patients with > 50% improvement in Visual Analogue Scale (VAS). Two studies contemplated RFA in TKA., In our study we suggest caution in the interpretation of the results, as only 2 of 7 patients improved, and in one patient the improvement was greater when performing a arthroscopic lateral release after RFA. McCormick et al. described a conversion rate to TKA was 15.5% (5 out of 33). In our series, the conversion to TKA was 5% (2 out of 40). Questions arise as to whether the increase in BMI can predict poor results in RFA, if previous procedures such as arthroscopy or osteotomies can affect the outcome, or if bilateral OA supposes a more complicated population to treat pain. Better indications need to be fine-tuned. It can be considered to add a fourth target point, the intermediate genicular nerve. Another question is whether cooled and conventional RF is comparable. Concerning the use of cooled RF to increase the area of the lesion, 2 retrospective studies comparing cooled to conventional RF for sacroiliac joint disease have yielded mixed results, with 1 study demonstrating a trend for superior results with cooled RF., According to Bathia et al. and McCormick et al., there is lack of clarity regarding indications, clinical protocols, targets, and longevity of benefit from RF procedures. Strict clinical protocols are needed to fix the indication of neurotomy by RF in the knee pain, mostly in the case of TKA. Our study has the limitations that the sample size is insufficient to perform a comparative study between the osteoarthritis group and the painful arthroplasty group. Despite these limitations, the results suggest that the cooled radiofrequency for neurotomy of the genicular nerves is still useful a year after its completion, in a high percentage of patients, in the symptomatic relief of pain at rest, in the perception of improvement in the overall health and outcome of SF36, the rate of conversion to arthroplasty being small. Yu SP, Hunter DJ. Knee osteoarthritis: Management as a chronic disease. Med Today. 2016;17:39. Bruyère O, Cooper C, Pelletier JP, et al. A consensus statement on the European Society for Clinical and Economic Aspects of Osteoporosis and Osteoarthritis (ESCEO) algorithm for the management of knee osteoarthritis-From evidence-based medicine to the real-life setting. Semin Arthritis Rheum. 2016;45:S3-11. Park CN, White PB, Meftah M, Ranawat AS, Ranawat CS. Diagnostic algorithm for residual pain after total knee arthroplasty. Orthopedics. 2016;39:e246-252. Kennedy JC, Alexander IJ, Hayes KC. Nerve supply of the human knee and its functional importance. Am J Sports Med. 1982;10:329-335. Dellon A. Partial knee joint denervation for knee pain: A review. Orthop Muscul Syst. 2014;3:167. Choi WJ, Hwang SJ, Song JG, et al. Radiofrequency treatment relieves chronic knee osteoarthritis pain: a double-blind randomized controlled trial. Pain. 2011;152:481-487. Franco CD, Buvanendran A, Petersohn JD, Menzies RD, Menzies LP. Innervation of the anterior capsule of the human knee: implications for radiofrequency ablation. Reg Anesth Pain Med. 2015;40:363-368. Ikeuchi M, Ushida T, Izumi M, Tani T. Percutaneous radiofrequency treatment for refractory anteromedial pain of osteoarthritic knees. Pain Med. 2011;12:546-551. Bellini M, Barbieri M. Cooled radiofrequency system relieves chronic knee osteoarthritis pain: the first case-series. Anaesthesiol Intensive Ther. 2015;47:30-33. Farrar JT, Young JP Jr, LaMoreaux L, Werth JL, Poole RM. Clinical importance of changes in chronic pain intensity measured on an 11-point numerical pain rating scale. Pain. 2001;94:149-158. Kellgren JH, Lawrence JS. Radiological assessment of osteo-arthrosis. Ann Rheum Dis. 1957;16:494-502. Scuderi GR, Bourne RB, Noble PC, Benjamin JB, Lonner JH, Scott WN. The new knee society knee scoring system. Clin Orthop Relat Res. 2012;470:3-19. Ware JE, Kosinski MA, Keller SD. SF-36 Physical and Mental Health Summary Scales: A User’s Manual. Boston, USA: The Health Institute, New England Medical Center; 1994. McCormick ZL, Korn M, Reddy R, et al. Cooled radiofrequency Ablation of the genicular nerves for chronic pain due to knee osteoarthritis: six-month outcomes. Pain Med. 2017;18:1631-1641. Iannaccone F, Dixon S, Kaufman A. A review of long-term pain relief after genicular nerve radiofrequency ablation in chronic knee osteoarthritis. Pain Physician. 2017;20:E437-e444. Gupta A, Huettner DP, Dukewich M. Comparative effectiveness review of cooled versus pulsed tadiofrequency ablation for the treatment of knee osteoarthritis: a systematic review. Pain Physician. 2017;20:155-171. Protzman NM, Gyi J, Malhotra AD, Kooch JE. Examining the feasibility of radiofrequency treatment for chronic knee pain after total knee arthroplasty. PMR. 2014;6:373-376. Provenzano DA, Lutton EM, Somers DL. The effects of fluid injection on lesion size during bipolar radiofrequency treatment. Reg Anesth Pain Med. 2012;37:267-276. Vallejo R, Benyamin R, Tilley DM, Kelley CA, Cedeño DL. An ex vivo comparison of cooled-radiofrequency and bipolar-radiofrequency lesion size and the effect of injected fluids. Reg Anesth Pain Med. 2014;39:312-321. Cohen SP, Strassels SA, Kurihara C, et al. Outcome predictors for sacroiliac joint (lateral branch) radiofrequency denervation. Reg Anesth Pain Med. 2009;34:206-214. Cheng J, Pope JE, Dalton JE, Cheng O, Bensitel A. Comparative outcomes of cooled versus traditional radiofrequency ablation of the lateral branches for sacroiliac joint pain. Clin J Pain. 2013;29:132-137. Bhatia A, Peng P, Cohen SP. Radiofrequency procedures to relieve chronic knee pain: an evidence-based narrative review. Reg Anesth Pain Med. 2016;41:501-510. ACA and JALR participated in the conception of the review, data acquisition, analysis and interpretation, and the drafting of the manuscript. MPSC designed and conducted the study. The protocols had been approved by the Ethics Committee of University Hospital of Son Espases, Palma de Mallorca (Balearic Islands), Spain. The study protocol will be performed in strict accordance with the Declaration of Helsinki. The authors certify that they had obtained all appropriate patient consent forms. In the form, patients had given their consent for their images and other clinical information to be reported in the journal. The patients understood that their names and initials would not be published and due efforts would be made to conceal their identity, but anonymity could not be guaranteed. Datasets analyzed during the current study are available from the correspouding author on reasonable request.